Caitlin Kuk attended Baker College in Flint to earn her Physical Therapist Assistant degree. She is certified in Astym and kinesiology taping and has completed multiple continuing education courses including: Lumbar spine, knee, shoulder girdle, and SIJ. 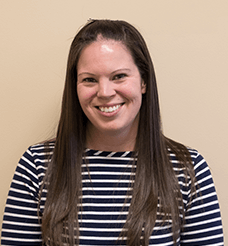 Caitlin has six years of experience as a licensed Physical Therapist Assistant. Outside of work, she enjoys playing with her two girls (4 and 2 yrs old), swimming/going to the beach in the summer, and house projects.